Do You Want to Learn More About Optimizing Movement and Enhancing Performance? I’m really excited to be launching my brand new course for rehabilitation and fitness professionals looking to help people restore, optimize, and enhance performance. It’s my Introduction to Performance Therapy Training course. And you know what the best part is??? Check out the information and video below, and click the link below to enroll today! If you’re anything like me, I’m sure you’d love to work with more highly motivated people, and even athletes, that want to focus on improving their performance. But I remember not really feeling prepared for this or knowing how to get started, I really felt overwhelmed. We all learned the basics, but no one really teaches you how to optimize movement and enhance performance. Over these years, I’ve learned a ton. Good and bad! But everything I have learned has shaped what I do, and it took some time and experience to realize this. There so much info out there, but people tell me all the time they’re still confused and that they feel like they just start treatments and training programs and aren’t even confident that they choosing the right ones! I want to help. When we started our facility at Champion PT and Performance, one of our biggest goals was to develop a simple system for our physical therapists and strength coaches to help people move and perform better. 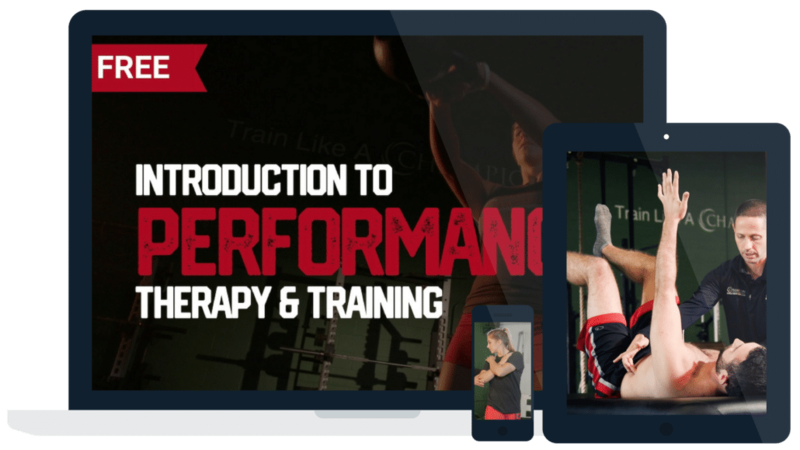 My Introduction to Performance Therapy and Training program will teach you our 4-step system at Champion to assure you have everything you need to start helping people move and perform better. Best of all, it’s absolutely free to anyone that signs up for my Newsletter. You’ll get all my best articles straight to your email, and immediate free access to the course. Thank so much, hope you enjoy! https://mikereinold.com/wp-content/uploads/MikeReinold.com-Blog-Featured-Image-14.jpg 628 1200 Mike Reinold https://mikereinold.com/wp-content/uploads/MikeReinold-Small-Signature-Logo-2017-red.png Mike Reinold2019-01-28 06:00:302019-01-16 16:30:20Do You Want to Learn More About Optimizing Movement and Enhancing Performance? This week’s article is a guest post from Michael Infantino. Michael reached out to me on Facebook and sent me the below videos of a patient’s improvement in scapular winging after dry needling the serratus anterior. I wanted to share the below article that Michael wrote showing the videos, but also talk about how trigger points may be involved. I’m not sure what to make of these videos, if trigger points are involved, or exactly how dry needling the serratus anterior helped this patient’s winging. But I am sure that I was impressed with the results. I wish we knew more about the reasoning and mechanism, but in the meantime I’m happy we can help people feel and move better. Can we correct scapular winging in a matter of minutes? This obviously depends on the cause of the scapular winging. It is well documented that injury to the long thoracic nerve or cervical spine may lead to medial border scapular winging or dyskinesia of the scapula (Meininger, 2011). These are always challenging. Ruling out neuromuscular cause can be done with a nerve conduction velocity test or EMG. Appreciating these findings would lead most to conclude that treatment of trigger points could improve scapular mobility and timing. This was my immediate thought when I noticed a significant medial border scapular winging while watching my patient raise and lower his arm. It wasn’t until I read this research that I began using dry needling to do more than just manage pain. The results seen following dry needling to the serratus anterior were remarkable. It is well documented that appropriate muscle activation patterns (MAP) surrounding the shoulder is necessary for efficient and pain free mobility (Lucas, 2003). Lucas and group actually gauged the effect of trigger point dry needling on MAP in subjects with latent trigger points (LTrP). “Latent myofascial trigger points (LTrPs) are pain free neuromuscular lesions that are associated with muscle overload and decreased contractile efficiency” (Simons et al., 1999, p. 12). MAP’s of the upper trapezius, serratus anterior, lower trapezius, infraspinatous and middle deltoid were compared in a group with LTrP’s and one without. Following surface EMG, the LTrP’s were treated with trigger point dry needling. Surface EMG was performed after treatment as well. Muscle activation of the upper trapezius in the LTrP group pre-treatment. Early activation of the infraspinatous in the LTrP group pre-treatment. Increased variability of muscle activation in all muscles assessed in the LTrP group pre-treatment compared to the control group. Altered MAP of distal musculature (infraspinatous and middle deltoid) were consistent with co-contraction, a finding that has been attributed to increased muscle fatigability (Chabran et al., 2002). Improved muscle activation times in the LTrP group following dry needling. Significant decrease in the variability of muscle activation in the LTrP group following dry needling, except for the serratus anterior. The serratus anterior and lower trapezius showed increased variability in both the control and LTrP group, which may be why the results did not reach significance. This is also consistent with the latest research in JOSPT that found dyskinesia to be normal in asymptomatic populations. (Plummer, 2017). Based on the both my clinical experiences and the research presented in this paper, it would seem highly valuable to focus on the treatment of trigger points to restore muscle activation patterns surrounding the shoulder complex. Being able to press the “reset button” on a muscle is important for re-establishing normal muscle activation patterns prior to exercise. Inclusion of other manual therapy and exercise techniques is important for optimizing function of the local musculature (range of motion, hypertrophy, strength and endurance). No research that I am familiar with has compared dry needling to other manual therapy techniques for restoring MAP in muscles adjacent to the shoulder. Future research that compares various trigger point treatments for restoration of normal MAP would be beneficial. Dr. Michael Infantino, DPT, is a physical therapist who works with active military members in the DMV region. You can find more articles by Michael at RehabRenegade.com. Alburquerque-Sendin, F., Camargo, P.R., Vieira, A., Salvini, T.F., 2013. Bilateral myofascial trigger points and pressure pain thresholds in the shoulder muscles in patients with unilateral shoulder impingement syndrome: a blinded, controlled study. Clin. J. Pain 29 (6), 478e486. Bron, C., de Gast, A., Dommerholt, J., Stegenga, B., Wensing, M., Oostendorp, R.A., 2011a. Treatment of myofascial trigger points in patients with chronic shoulder pain: a randomized, controlled trial. BMC Med. 9, 8. Chabran, E., Maton, B., Fourment, A., 2002. Effects of postural muscle fatigue on the relation between segmental posture and movement. Journal of Electromyography and Kinesiology 12, 67–79. Celik, D., Yeldan, I., 2011. The relationship between latent trigger point and muscle strength in healthy subjects: a double-blind study. J. Back Musculoskelet. Rehabil. 24 (4), 251e256. Cummings, T.M., White, A.R., 2001. Needling therapies in the management if myofascial trigger point pain: a systematic review. Archives of Physical and Medicine and Rehabilitation 82, 986–992. Ge, H.Y., Arendt-Nielsen, L., Madeleine, P., 2012. Accelerated muscle fatigability of latent myofascial trigger points in humans. Pain Med. 13 (7), 957e964. Ge, H.Y., Fernandez-de-las-Penas, C., Arendt-Nielsen, L., 2006. Sympathetic facilitation of hyperalgesia evoked from myofas- cial tender and trigger points in patients with unilateral shoul- der pain. Clin. Neurophysiol. 117 (7), 1545e1550. Ge, H.Y., Fernandez-de-Las-Penas, C., Madeleine, P., Arendt- Nielsen, L., 2008. Topographical mapping and mechanical pain sensitivity of myofascial trigger points in the infraspinatus muscle. Eur. J. Pain 12 (7), 859e865. Hillary A. Plummer, Jonathan C. Sum, Federico Pozzi, Rini Varghese, Lori A. Michener. Observational Scapular Dyskinesis: Known-Groups Validity in Patients With and Without Shoulder Pain. J Orthop Sports Phys Ther:1-25. Ibarra, J.M., Ge, H.Y., Wang, C., Martinez Vizcaino, V., Graven- Nielsen, T., Arendt-Nielsen, L., 2011. Latent myofascial trigger points are associated with an increased antagonistic muscle activity during agonist muscle contraction. J. Pain 12 (12), 1282e1288. Lucas KR, Polus BI, Rich PS. Latent myofascial trigger points: their effects on muscle activation and movement efficiency. J Bodyw Mov Ther. 2004;8:160-166Meininger, A.K., Figuerres, B.F., & Goldberg, B.A. (2011). Scapular winging: an update. The journal of The American Academy of Orthopaedic Surgeons, 19(8), 453-462. Simons, D.G., Travell, J.G., Simons, L.S., 1999. The Trigger Point Manual, Vol 1, 2nd Edition. Williams and Wilkins, Baltimore, USA. Wadsworth, D.J.S., Bullock-Saxton, J.E., 1997. Recruitment patterns of the scapular rotator muscles in freestyle swimmers with subacromial impingement. International Journal Sports Medicine 18, 618–624. Instrument assisted soft tissue mobilization (IASTM) is really a great manual therapy skill to have in your tool box. However, there are many myths and misconceptions regarding IASTM that I really believe are holding people back from getting started and seeing the benefits of IASTM in their practice. IASTM does not have to be expensive to learn or perform. You do not need to spend tons of money on certification courses and crazy expensive tools. Erson and I have a quick and easy online educational program at IASTMtechnique.com that will get you started right away. We even talk about how you can get useable tools for as little as $5! IASTM does not have to be complicated to learn. If you are already performing manual therapy or massage, you know everything you need to know to start using IASTM. IASTM should not make everyone black and blue! Let me actually rephrase that for emphasis, IASTM is not about being so aggressive that you leave large purple marks and essentially produce superficial capillary hemorrhage. Some redness and petechia is OK, but the over aggressive black and blue is not ideal. IASTM tools do not provide as much feedback as my hands. IASTM is a way to compliment your hands, it is not a replacement! In fact, it gives you a different feel that really helps your palpation skills. Learn How to Start Performing IASTM Today! Erson Religioso and I’s online educational program will teach you everything you need to know to start using IASTM today! IASTM does not have to be complicated to learn or expensive to start using. Learn everything about IASTM including the history, efficacy, tool options, different stroke patterns, basic techniques, advanced techniques, and how to integrate IASTM into your current manual therapy skills and treatment programs! IASTM Technique 2.0 has now be released with updated research, new content, and now includes how to perform cupping and use mobility bands! Get started today! Erson Religioso and I have a nice video for you discussing why and how we both started using instrument assisted soft tissue mobilization (IASTM). Like many people, I held out initially as I wanted to hear and see more. However, the more I learned the more interested I became. IASTM has now become a game changer for me and something I deeply integrate into my manual therapy techniques, and think you should too. It doesn’t have to be complicated, expensive, or time consuming to start using IASTM. In this video, Erson and I describe how and why they both started using IASTM, how we integrate IASTM with other manual techniques and exercise, the major benefits of IASTM, and then some brief technique demonstrations. One of the most common compensations we see with people with limited overhead shoulder elevation is lateral winging of the scapula. Anytime you have limited glenohumeral joint mobility, your scapulothoracic joint is going to try to pick up the slack to raise your arm overhead. This is common in postoperative patients, but also anyone with limited shoulder elevation. Stabilizing the scapula during range of motion is often recommended to focus your mobility more on the shoulder than the scapula. As with everything else, as simple as this seems, there is right way, a wrong way, and a better way to stabilize the scapula during shoulder elevation. In this video, I demonstrate the correct way to stabilize the scapula, and show some common errors that I often see. Interested in learning more? Join my acclaimed online program teaching you exactly how I evaluate and treat the shoulder. It’s a comprehensive 8-week online line program that covers everything you need to know about clinical examination, dynamic stability drills, manual therapy techniques, rotator cuff injuries, labral tears, stiff shoulders, and more. The latest Inner Circle webinar recording on Integrating Performance Based Physical Therapy is now available. This month’s Inner Circle webinar is on Integrating Performance Based Physical Therapy. This presentation is actually my talk from the recent Champion Bridging the Gap From Rehab to Performance Seminar that we conducted in Boston last month. I wanted to share this with Inner Circle members as I feel the topic is important as performance based therapy is definitely the future of our professions. Performance therapy is something that is performed to help people optimize themselves and improve performance, no matter what performance means to you. You don’t need to be injured to benefit from performance therapy. This is a lot of what we do at Champion and something that I really wanted to share. We are actually going to be releasing an online version of the Champion Bridging the Gap From Rehab to Performance Seminar, which will include this presentation, plus others from Lenny Macrina, Dave Tilley, Rob Sutton, and Kiefer Lammi. Inner Circle members can access my talk now, and get early access to purchase the seminar. Everyone else will have to wait until the official launch next week! Plus, if you’d like to purchase the seminar, I also have a $10 off coupon just for Inner Circle members. All the links will be in the Inner Circle Dashboard. One of my big principles of rehabilitation and corrective exercises is that you follow up mobility drills with some sort of activation or strengthening drill. You want to use the body in this newly gained mobility. For some reason, I feel like this is often ignored with thoracic mobility. I would actually argue that a very common reason for having limited thoracic mobility is poor endurance into thoracic extension. The muscles can’t maintain an extended posture and resort to the path of least resistance, a slouched posture. If you are going to spend time working on thoracic extension mobility, you should follow that up by working on thoracic extension endurance. In the video below I show an extremely easy way to start working on thoracic extension endurance. Certainly not groundbreaking, but an important drill that is often overlooked. Limited mobility of the thoracic spine is a common finding and something that tends to get worse over time. To me, it’s one of those “use it or lose it” types of mobility in the body. Several issues can occur from limited thoracic mobility, such as shoulder, neck, and even low back pain. Thoracic mobility drills are common, but only part of the puzzle. I have a new presentation where I’ll be reviewing some of the self mobility, manual therapy techniques, and corrective exercises I use to enhance thoracic mobility. You can purchase access to this presentation for only $10, or join my online Inner Circle Mentorship program for only $10/month and gain access to this and ALL my past presentations, product discounts, exclusive content, member only forum, and more!